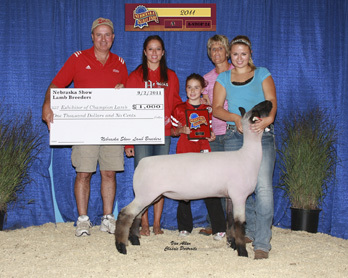 Courtesy photoMarlin, Mallory, Camry, Polly and Jacque Murdoch with the 2011 Nebraska State Fair Grand Champion in the Breeder's Classic. After 30 years in the club lamb business, Polly Murdoch knows what she is looking for in a club lamb, and she has a number of championships to prove it. “I started raising club lambs when I was 16-years-old,” Polly said. “My dad and I purchased 10 bred ewes from Bill Hansen of Upland, and the operation grew from there.” Some 30 years later, Fairwether Club Lambs of Orleans, Neb., is operated by Polly, her husband, Marlin, and their daughters, Mallory, Camry and Jacque. They now have a herd of over 150 ewes, and during the last 30 years have sold lambs to youth in over 28 states. “We have had many, many winners,” Polly said of the operation. They’ve sold lambs that have won the Louisiana, Colorado, Nebraska, Minnesota and Wisconsin State Fairs, and lambs that have won prestigious shows like the American Royal and Ak-Sar-Ben. “The number one thing my flock has that is important to me is touch,” she continued. “I like sheep with very good touch to them. The hip structure of our sheep is also very important. When picking out club lambs, Polly said she encourages youth to look for lambs with good structure and pattern, and a three dimensional hip. They should also look at the maturity of the lamb and select one that has “grow power” and the right design. “Don’t pick out a lamb that will stop growing mid-way through the summer,” she said. To stay on top of the game, Polly travels to many sales to not only promote her own lambs, but see what other breeders have to offer. “We consign some lambs each year to the Midwest Elite in Richmond, Indiana,” she explained. “Breeders from all over the nation bring lambs to that sale. It is an opportunity for me to look at the different types of lambs other breeders have. 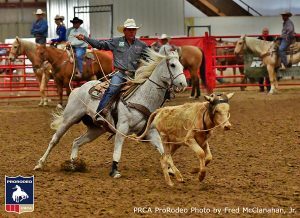 I think it is important to get out of your own barn, and travel to look at what other breeders are producing,” she said. “I don’t out-cross with a lot of different breeders across the country, but I have purchased rams from some pretty successful breeders to bring some other influence into my flock,” she explained. Although Polly no longer holds her own club lamb sale, youth can still purchase her lambs private treaty. In addition, she also consigns lambs at the Midwest Elite, and in a club sale at Kearney with four other breeders that is held the second Sunday in April.